Johannes van Dam was without doubt the Netherlands’ leading food writer of the twentieth century. He owned the biggest library of cookbooks in Europe (perhaps even the world), which is now housed in the University of Amsterdam. I got to know van Dam when he started buying fish at my first shop and he became my mentor. Each time I was planning a new book, I would start by talking to Johannes, as a chat with him was worth four years at hotel school. Johannes was a friendly man but, if he spotted you making a mistake, he was merciless. We were once invited to do a blind fish finger tasting on television and a camping stove was set up in the studio to fry them on. “You can’t fry fish fingers on that,” Johannes protested and he certainly didn’t mince his words. That day we got a two-hour lecture on fish fingers, from the right type of fish and the fillet being in one piece, not scraps pressed together, to the correct proportion of fish to crust and that the crust shouldn’t have too much flavour as it would detract from the fish. I now know everything there is to know about fish fingers! stir well and crush the tomatoes lightly with the back of the spoon. Cook for 5 minutes over a low heat, add the sugar, vinegar, a few drops of Tabasco and a pinch of salt, and leave until the sauce reduces by two-thirds. Push the sauce through a metal sieve (strainer) to make it smooth. Taste and season with salt and pepper. Cool, transfer to a bowl, cover and chill in the refrigerator until needed. Cut the cod fillets into fish finger shapes. You can make them any size but they all need to be approximately the same thickness so they cook in the same length of time. Pat the fish fingers dry with kitchen paper (paper towels) and season with salt and pepper. Mix the panko with the paprika, coat the fish in the flour, then in beaten egg and finally in the panko-paprika mix. Set aside. Heat 300 ml/10 fl oz/1¼ cups of oil in a frying pan over a high heat. The oil should be heated to a temperature of 180°C/350°F and reach roughly halfway up the fish fingers when you add them to the pan. You can check the oil is the correct temperature by using a thermometer or by adding a small piece of white bread, which should rise immediately to the surface of the oil and brown quickly. 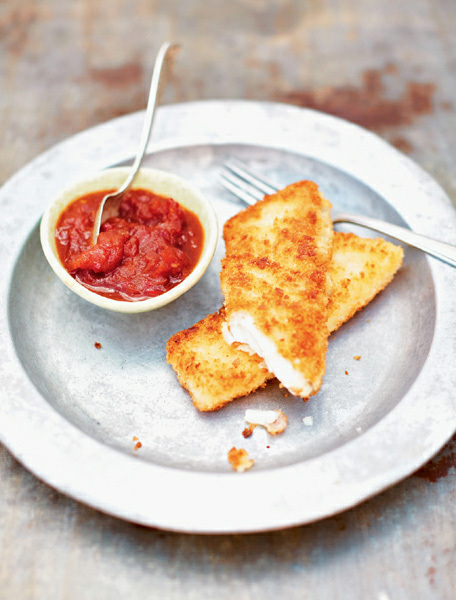 Fry the fish fingers for 3–4 minutes on each side until golden brown. Remove from the pan and drain on kitchen paper. Serve the fish fingers with the ketchup.